The other day I had one of those Horrible Parent episodes. It was the 4th of July and the plan was to take the kids to see Toy Story 3 around lunchtime and then go home for a nap and head out in the afternoon for Ala Moana to see the fireworks show. Unfortunately, Mr. Pikko had an allergy attack and we couldn’t go and we ended up camping out in the living room watching the Star Wars marathon on Spike TV. The kids were really enjoying it, which tickled me silly, until Buddy suddenly realized that the popping noises outside were fireworks. At first he was just excited, but then after a few he looked at me and said, “Mommy, is it America’s birthday?” I told him that yes, it was. Suddenly he broke down in tears and said that he’d “missed America’s birthday” and that we were supposed to play “sprinklers” to celebrate. I apologized to him repeatedly and took him to the bathroom to sing Happy Birthday to America and blow out a candle. He was still brokenhearted for the rest of the night and I felt like total crap. To make things even worse, his school calendar says today they’re going to share their weekend experiences. I’m pretty sure he won’t remember going to the movies, but maybe he’ll remember that Brock Lesnar won on Saturday? That was really cute. We watched it at Grandma J’s house and when she came to ask what we were yelling about, he yelled, “BROCK LESNAR WON, GRAMMA!” Him and Baby Girl spent about an hour playing UFC together after that. For the next two days, he kept complaining his body hurt, poor guy. 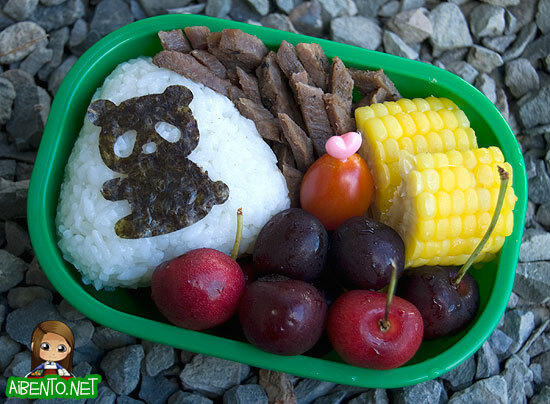 This is a quick bento I threw together this morning in under 10 minutes. I’d made the musubi the night before, wrapped it in saran wrap, and stored it in a bag with the corn and meat, which we had at Grandma J’s house. I plopped a pre-cut nori panda from a packet I have and cut the teri beef with kitchen shears into little strips. 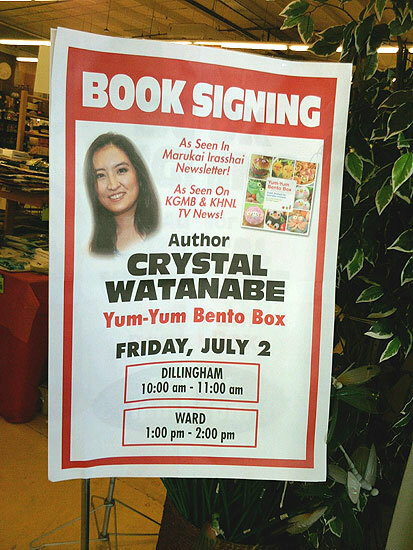 Many thanks to the folks at Marukai who put together my two book signings! They made really big posters at the store and I got to meet some very nice people at both signings. One woman came by just to congratulate me on being published at such a young age, telling me it’s been a dream of her own for a long time. Another brought her two kids and had me take a photo with them, then informed me that Stephanie is a fan of my blog and she had me sign a note for her. Thanks Stephanie!! Here’s the cool poster they made! Big thanks to Susan who came by the Ward store with her family and gave me a lei! I also got to reconnect with an old friend from high school who came by to see me. 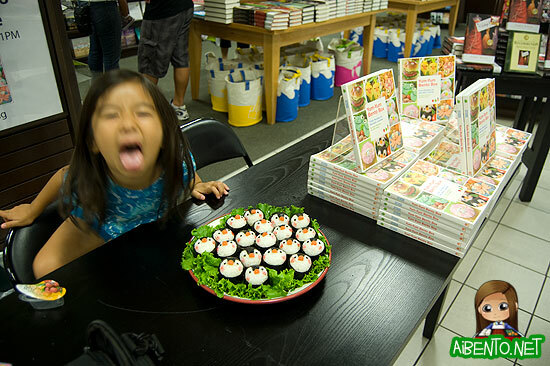 The price for the book at Marukai was actually a very good deal. The book was selling for $12.99. They still have copies if you’d like to pick one up and couldn’t make it to the signing! 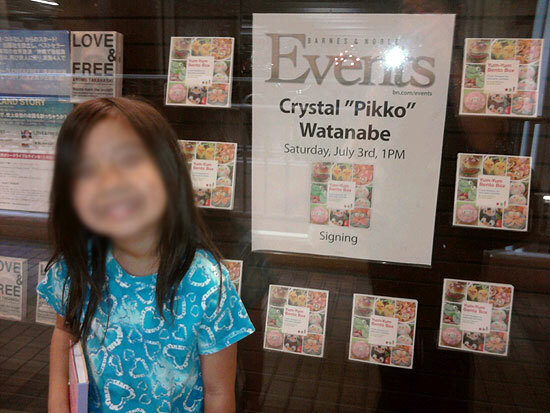 On Saturday, I had the Ala Moana Barnes signing, which was very nice. I was at a table in the front of the store and a nice big sign was in the front window. Baby Girl started cracking up laughing when she saw this. I have to give thanks to Haunani for making me feel so welcome at the store. Apparently her favorite one in the book was the penguins, so when I showed up with a tupperware full of them she was totally tripping out. I also have to thank my family for coming by and supporting me! I finally got to meet LOST blogger Ryan Ozawa and his family too! Read his review of Yum-Yum Bento here! 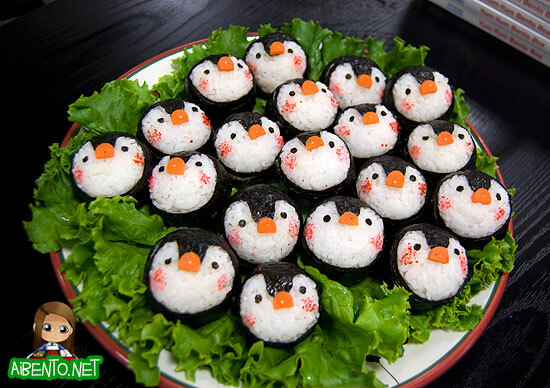 Here’s a closer look at the penguins. I changed the cheeks, opting to use dabbed hana ebi instead of circle meats. I had used somen noodles to attach the noses, but that was a terrible idea since the somen was way too soft once it moistened up. Buddy was surprisingly well-behaved and I actually kept him with me at the table for about half the time before he got bored. When he saw me on Sunrise at Grandma J’s, he kept replaying the TiVo recording and watched me like 5 times. Later, when I asked him if he’s my number one fan, he said yes and began fanning me with his hand and blowing in my face. LOLOLOL!! !